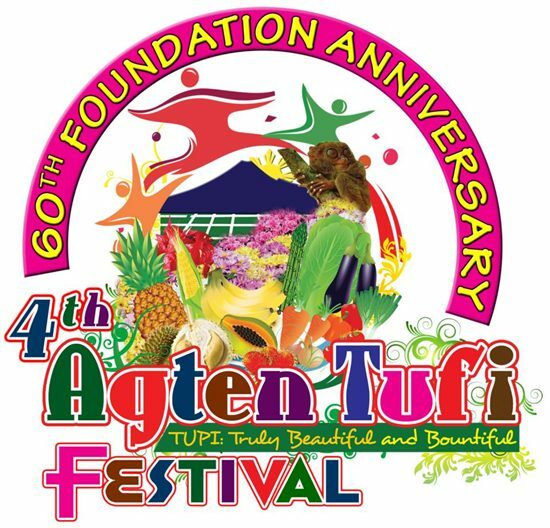 Few days to go and the colorful Agten Tufi Festival will be again celebrated in the Municipality of Tupi, South Cotabato. A B'laan term which means "bountiful or beautiful Tupi", Agten Tufi Festival is a thanksgiving celebration of the town's beauty and bounty. It showcases the talents and competitiveness of the people of Tupi, rich culture and as well as the town's abundant supply of fruits, flowers and vegetables. Exciting events included in this year's Agten Tufi Festival are drum and lyre competition, mass dance, Tupi Singing Idol, Group Gay Lipsynch Contest, the annual search for Mutya ng Tupi and the much anticipated street dancing competition among others. Local produce of the people of Tupi will be showcased through the Agri Trade Fair which will run from September 2. The 11-day celebration will kick-off on August 30 through a thanksgiving mass and will end with a culmination program and other activities on September 11 which is also the foundation day of Tupi. Below is the schedule of activities for Agten Tufi Festival 2013 in Tupi, South Cotabato.